I completed one block today.... only 15 more to go! Instead of using the paper piecing templates given in Fons & Porter's magazine to make the flying geese blocks, I used the "Quilt in a Day" small flying geese ruler. It's a super easy and fast way to make the flying geese, but then they finished slightly larger than those in the magazine pattern. My finished complete block measures 22.5", so my finished quilt will be larger too at 90" square. I agree about the flying geese - I love QID's ruler. Your block is beautiful. WOW that looks great! Can't wait to see the end. I love this block! Very striking! I look forward to seeing this quilt progress. Beautiful! I had to go look up the magazine, because I didn't remember seeing that quilt. Yours is delicious, much better than a navy and white quilt! Oh, how Lovely! The colours look great, can't wait to see it all put together! Very nice! I like your fabric choices. I am working on that very same quilt although I didn't find it in a Fons & Porter magazine...instead it was the Big Book of Scrap Quilts. 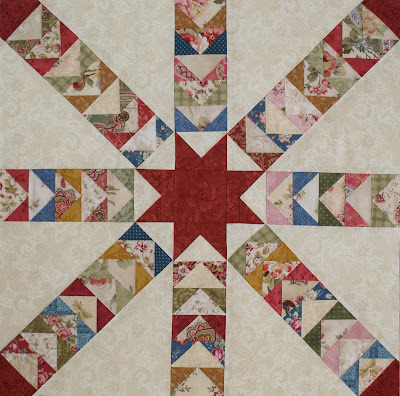 I love scrap quilts and this is beautiful!!! I can't wait to see it finished! !